Hi there! I want to talk about something that is near and dear to my teacher heart. This topic is one of the "hills I would die on" as my former principal used to say. During staff meetings or before school at our weekly huddles, she would ask, "What are you passionate about? What is one thing that you'll never compromise on? What are you willing to fight for?" It took me a while to figure out what my "hills" were. The physical environment of a classroom is one of those. What do you mean by "physical environment?" When I start talking to people about setting up an intentional, research-based environment, I am talking about colors, decor, things on the walls, lighting, music, scent, seating, materials, fabrics......it covers it all. It means that every single song you play, light you turn on, air freshener you spray, or border you buy makes a difference. This is where I'll stop and say that everything that I discuss is my own opinion, and no matter if it is based on research, theory, or my own practice, I hope that you understand that I don't mean to call one type of environment "better" than another. This is my own personal belief, and it may be very different than yours. That's ok! But I hope that you can take away a few new thoughts regarding classroom environment. So, what does the "research" say? I don't like it when people tell me to do something because, "According to research....". I hope I can explain my beliefs in a way that doesn't sound preachy but that definitely talks about what the research says about environment. There are so many books, articles, and studies I could refer you to. One of the most recent articles that I continue to refer people to over and over again is this one from The New York Times called Rethinking the Colorful Kindergarten Classroom. It is based on a study done by Carnegie Mellon University regarding what goes on the walls of classrooms and the correlation to lack of attention and focus. This article from the NAEYC called Consider the Walls was first given to me when I was an undergrad student in Child and Family Studies. For students in the Early Childhood Education program (which I was), a requirement was two semesters of courses that focused on the classroom environment. During those classes, I learned so much. I had never given a second thought to how teachers decorated their classrooms. Who knew that lighting and colors mattered? We also read this book called Designs for Living and Learning. I recommend adding it to your professional library! The main idea from my learning during this time was that the environment should be a canvas for children, not a pre-made art piece. Students should be able to walk into their classroom and add their own personalities. 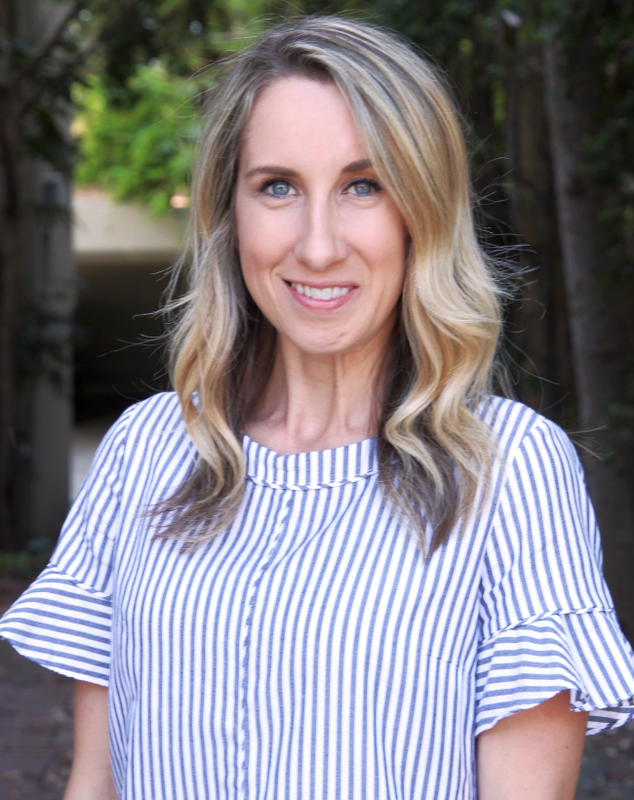 If a teacher has overtly decorated the room before the school year even starts, many students may not feel a connection to the room that they walk into on the first day. I have also studied Waldorf, Montessori, and Reggio Emilia schools and their approach to the physical environment. You won't see store-bought posters, bright colors, plastic caddies, or fluorescent lighting. 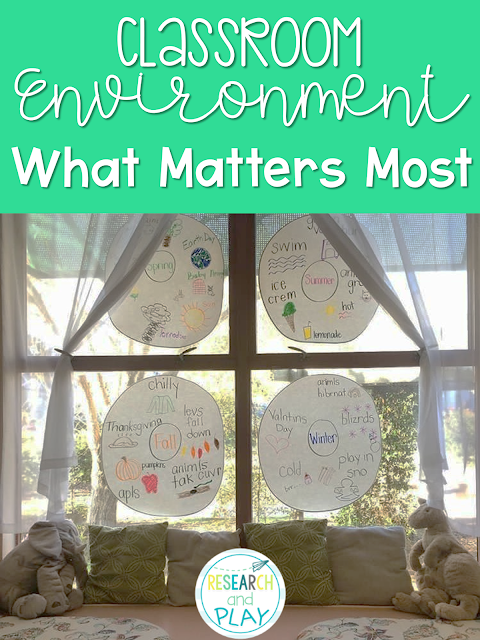 Instead, you'll see lots of student-created word walls and number lines, provocations instead of centers, colors that reflect the natural world, woven baskets and glass jars, and natural lighting. The classroom won't be blank, but will be a more natural-looking space, similar to someone's home. Finally, I'll speak to colors and music. As a graduate student, I studied Quantum Learning. Research has been done to show what kinds of emotional responses can be initiated by colors. You'll see me use a lot of cool colors or colors found in nature because of what I've learned through Quantum Learning. You'll also hear lots of music in my classroom, but it will very rarely be popular top 40 hits. You'll hear classical piano, solo guitar, or ukulele covers. Quantum Learning shares the belief that music can be used to excite and engage, but use that kind of music sparingly. Use it primarily to focus or calm. 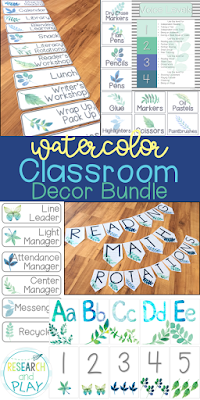 I use these specific colors and design in my classroom labels, signs, schedule cards, calendar, etc! 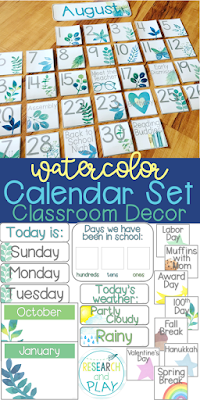 You can find my Watercolor Classroom Decor Bundle and my Watercolor Calendar Set in my TpT shop. Just changing your labels can make a HUGE difference! Consider your classroom. Who does it look like spends time there? If you have one wall with student work, that isn't enough. Students' presence should be felt through the materials you have for them on their tables. It should be felt through the organization of the space, the seating, the centers, the organization. Your own personal love of pink polka dots should not be the focus of your classroom decor. There should not be so many posters, pre-made bulletin boards, borders, signs, etc. that the students don't know where to look when they walk in. It is OKAY to have blank walls at the beginning of the school year. Let the students make their mark in your room. Be careful not to take that away from them for the fear of having an empty bulletin board. This is not YOUR room alone. This is YOURS and YOUR STUDENTS' room. Make sure that is evident. Make sure every child, from the girliest-girl to the toughest boy to the student who doesn't fit into typical gender stereotypes feels comfortable there. Yes, you do spend a lot of time in there. You do want it to be a place you like to be in. I understand that. But this isn't about us, teachers, It's about our students. Make the classroom that they spend time a place where they see themselves reflected and respected. Thank you so much for reading about something that is so important to me. I do not claim to have the perfect classroom, nor do I claim to know all there is about the perfect classroom environment. I just know that I am constantly learning how to make my classroom the best learning space for the children who spend time there. Please feel free to reach out with any questions you have!